GALERIES : 206 espèces d'oiseaux. Toutes les images sont distibuées par l'agence NATURIMAGES. Gliding birds continually change the shape and size of their wings, tuning performance by means of morphology. Aerodynamic theory predicts that birds should adjust wing sweep to suit glide speed and now a more refined aerodynamic model has been developed, based on wind-tunnel data. 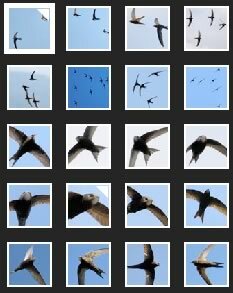 The results reveal a remarkable degree of control: swifts can halve sink speed or triple turning rate by choosing the most suitable sweep. Extended wings are used in slow glides and turns, swept wings for fast glides and (sacrificing lift for load bearing) in fast turns. The efficiency of 'morphing' wings is such that aircraft designers see them as possible successors to current variable-geometry wings: but the swift got there first. 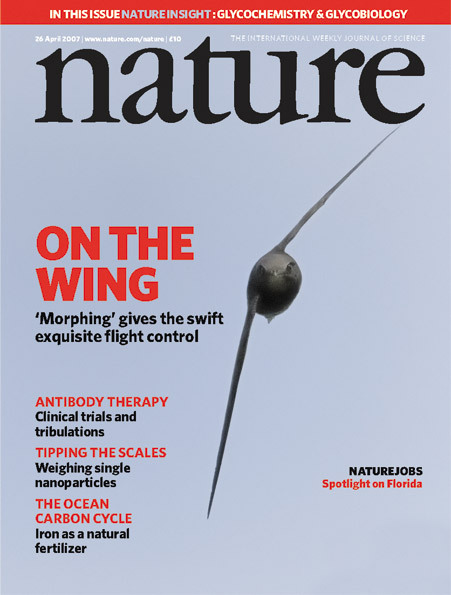 The stunning cover photo, by Jean-François Cornuet, shows a gliding swift in a tight turn. Taken at the swift's flight level, it shows how thin and straight the wings remain during a steady glide. Note also that the bird's head is kept horizontal to maintain a level image of its surroundings.etter: How swifts control their glide performance with morphing wings. D. Lentink, U. K. Müller, E. J. Stamhuis, R. de Kat, W. van Gestel, L. L. M. Veldhuis, P. Henningsson, A. Hedenström, J. J. Videler & J. L. van Leeuwen.